A small group of eight and a wonderful guide (Claire), who artfully avoided the BIG bus tours during the entire day. 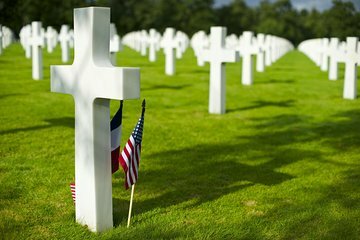 For the most part, we were able to visit most of the sites with no or limited crowds during this 75th-anniversary year of the Battle of Normandy. She also made sure that we were able to attend the solemn 5 pm ceremony of the bringing down at the front of ropes. As an US military veteran, the opportunity to stand at attention with no one in front of me during the playing of taps and to honor the sacrifice of the fallen was incredibly moving. In addition to the military aspects of the tour, our lunch was also in a smaller local restaurant that offered delicious crepes in a peaceful, uncrowded environment (again too small to cater to the BIG buses). We also we treated with a cider tasting at a villa dating back to the 1500s that only our group attended. Quite special! All in all, well worth the 6:15 AM to 9:30 PM day from Paris!!! We had an excellent guide, Oliver, and he made all the difference because of his knowledge of D Day, and his great enthusiasm. This is a wonderful tour. The small group makes the experience perfect. Antoine is an outstanding and knowledgeable guide. It was a wonderful tour to be on. Our group's knowledgeable guide provided insightful information on the way to Normandy and at each stop we made. He chose a wonderful restaurant for lunch and a fantastic stop at a local farm for cider and refreshments before we returned to Paris. It is a long day on this tour (about 13 1/2 hours for our day) but well worth the trip. If you are a History buff, you will be in awe taking this tour. My wife and I thoroughly enjoyed this tour. Our guide was informative and made events that happened over 70 years ago come to life. The visit to the American Cemetery was sobering and made us appreciate more than we already did the sacrifice our soldiers. I would recommend this tour to everyone. Our day in August with Nikolas was really terrific from beginning to end. The van was comfortable and he's an excellent driver, and at just about an hour and half, the drive goes by really quickly. He talked with us on the way there and back, sharing lots of interesting detail about Normandy related to WWII and also the region in general. The cidery stop was lots of fun and it's the seriously the best cider you'll ever taste. When we got to the German bunkers and then on to Omaha Beach, Nikolas was a wealth of information but not so much that it was overwhelming. The D-Day museum he took us to was also fascinating. His easygoing personality helped make the day really enjoyable and of course our time at the Cemetery was extremely moving. Nikolas even timed the visit so we would be there for the lowering of the U.S. flag ceremony. 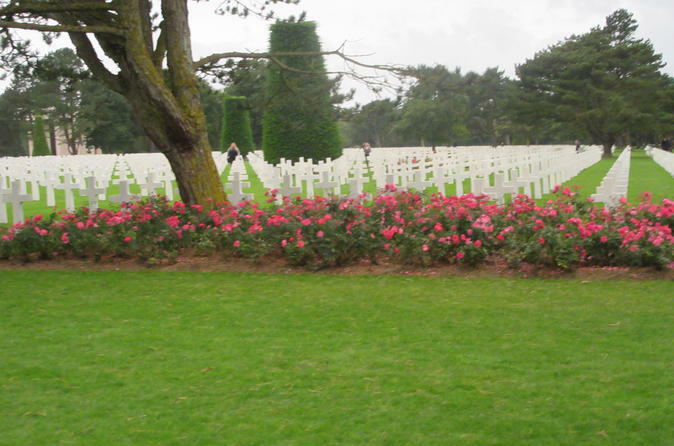 For the price this is a really excellent way to visit Normandy and see the beach and cemetery and the fact that it was Omaha Beach and not Utah really made no difference. It was definitely a 5-star experience and a highlight of our week in France! We had an awesome day! The trip was well the time and money. Our guide “Momo” could not have been more nicer. He was on time, very knowledgeable, friendly, and let the group take their time at the locations when needed. The cider tour was a little short but that was no problem because the focus was on the WWII sites. Even the owner of the cider farm was super nice. The country side of France was historic and beautiful. If you ever thought about going to Normandy, this is the trip! The driver/guide was ready to go promptly at the designated time and location. The drive to the Normandy region was pleasant — the shuttle bus was comfortable and we stopped about halfway to visit a rest area for a bathroom/snack break. Along the way the guide shared interesting facts and information about the area. The tour itself was well planned. The guide, Antoine, had so much information and could answer all the questions. He also had a notebook with him with more detailed overhead pics of the area. I never felt rushed and had time to see everything. Definitely recommend this tour for anyone who wants a day trip from Paris to the Normandy region to see the cemetery and beaches. This Day trip is worth the price. We had Olivia as a host and she was amazing. Although it was raining, she was very accomadating to those who were cold, etc. I learned so much on this tour. We were a group of 8 and it was perfect. Not a lot of walking for those who likes light activities. Normandy is moving and beautiful and recommended for every American. Our guide, Jean-Phillips, was very informed. Very nice tour.